So you’ve heard about Evernote more times than you can count and you’re ready to start using it in your real estate business. Maybe you’re tired of that Evernote geek in the office asking over and over if you’re using it yet? Perhaps you’ve tried a couple times to get on the Evernote bandwagon only to fall off each time? My love affair with Evernote had a few false starts as well. It took a major life event to make Evernote click for me. A cancer diagnosis in the summer of 2012 gave me a reason to stick with Evernote. All of a sudden, I had more documents than ever before coming my way. Scans, reports, lab work, explanations of benefits, schedules and more. Evernote made it simple to keep everything organized and available on any of my devices. I even use Evernote to share the blog posts I wrote chronicling my journey. There are some great books and help dedicated to Evernote for real estate professionals. Garry Wise, co-founder of The Paperless Agent, and Dean Ouellette, author of “Evernote for Real Estate,” easily come to mind. Here’s the problem: Jumping straight into Evernote to “go paperless” or handle a complex transaction like a residential escrow can be overwhelming. An easier way to get into Evernote is to find uses that simplify or organize some aspect of your personal life. Once a simple solution is mastered, it becomes easier to implement more complex strategies. And doesn’t finding a solution that saves time or effort in your personal life directly affect your professional life, too? 1. Chronicle events in your life. Next time there is a birthday party or celebration, capture photos, invitations and cards into a note or notes in Evernote. This can be done easily with your smartphone. Create a notebook with these notes, and add these notebooks to a “Personal Events” note stack. 2. If you have children or grandchildren, use Evernote to save everything related to them. Why maintain messy scrapbooks when you can scan or snap a photo of artwork, report cards and medical reports? Don’t forget to add photos of them to these notebooks as well. 3. Do you journal? 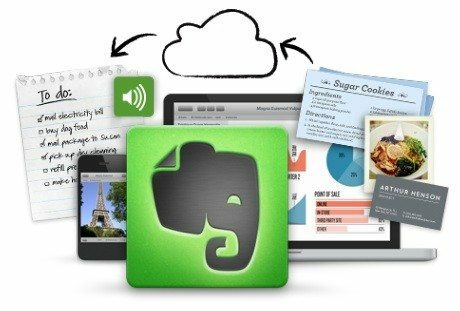 Why not use Evernote? Type content into notes and snap a selfie a week, too! 4. Going to an industry conference, say Real Estate Connect in San Francisco this summer? Use Evernote to record the audio of your favorite speakers and take notes at the same time in the same note. Snap pictures of the products displayed by vendors. Add business cards of those you meet into notes via your phone. 5. Scan or snap photos of receipts needed for expense reports or for that next tax return. Create notebooks for each type of expense incurred. My absolute favorite “easy to use” Evernote idea came from a local agent. When meeting a client, she takes a photo of her outfit using Evernote and adds the client’s name to the note. The next time she has an appointment with the same client, she searches Evernote for the client’s name and makes sure she does not wear an outfit she has already worn. Brilliant! Using one or two of the above strategies will make it easier to explore Evernote. Many people I talk to about Evernote say that it does too much. They do not know where to start. I agree. Evernote is powerful and limited only by one’s imagination. Start small and then expand your Evernote universe. Bill Risser is the vice president of new media and education for Chicago Title Agency in Arizona. Bill assists real estate professionals by teaching them how to use social and technology tools effectively and efficiently.